Northern Ireland born actor and DJ best known for playing Hodor on HBO series Game of Thrones. On his own website's 'about me' section it used to mention "Standing at 6'10" tall" and Kristian claimed on Twitter to be "6ft 11 ish" and also "I'm either 6ft 10 or 11 depending on the measuring tape". He also mentioned "After all these years, there is only one thing that makes me self conscious about my height. Airplanes.". This photo is from a London Film Con in 2013. I'm 41 and I'm 6ft 10in. Some people say I'm 6ft 11in, some 6ft 9in. I don't want them to shave off an inch, but I don't want them to add an inch either to disappoint people. 6'8 and over 360lbs now.. That is terrible to lose 1.25" of height in 40s, imagine Kristian make it through to his 60s wouldn't he be like 6'5.5" then? Thinking of a peak at 6'9 1/4 becomes 6'5 1/2 in 60s which is the case of Clint Eastwood losing near 10cm after age 80. Which i bet 6'5 1/2 Rory McCann would be like 6'4 3/4 in another 20 years looking close in height with Kristian Narin that sounds scary..
Hey Rob what did he by “depending on the measuring tape”? Maybe he got different heights when measured. One stadiometer gave him a different measurement than say a tape measure might? Or it could be, time of day had a bigger difference on his height, given he's over 6ft 7, he might shrink more than an inch in height, like 1.5 range. Peak was 6’9.75.” He is 6’8.5 now. Kristian's staggering height looks simply MASSIVE if Rob comes up to below his shoulders! I'd say 6ft8.5 and an inch more for peak. Big Rob is now Little Rob haha. Is 6'8 at his hairline there? I think his hairline is at least 1.5 inches. He towers over you Rob! Google has him at 7 ft lol. Massive bloke for sure, but who's in charge of fact checking these things over at the world's supposedly most reliable search engine? He definitely need to lose at least a 120 pounds to keep his health back and maybe he would gain a 1/2 inch or more up standing straight. He was report to weigh over 360 pounds like 371. That is 168kg. That is truely unhealthy. No offence just stating facts.. Being that tall and heavy that he is, it comes more with disadvantages than advantages. Certainly 10.5 at least I'd say. Rob in his peak at 6'9 he would have a full head on a 5'11 guy? yes he would, I think with his weight, hair and beard his head has looked 11 inch range in photos, but I'm not sure it's quite that big. Maybe a bit over 10 inches is possible though. He looks just under 6'9" next to Rob. I think he should be bumped up to 6'9". He stacks up next to Rob the same as Kevin Nash, and he has a 6'9" current listing. The photo is 5 years old now...since then Nairn has lost at least an inch, possibly a bit more. It's hard to tell what he'd measure, but he walks about at 6ft 6 range. How massive are his hands?! Let's just say he'd make a lousy pickpocket. he only looks about 195 in thet clip where he is walking with that posture. he cant really be taller than the current listing. the guy must weight about 180 kg mosty fat so in his case i can understand heightlos at this age. Rob, do you think his health is catching up to him to the point he may end up with diabetes if he does not lose weight?? It can be hard for people to control weight. I'd hope Kristian manages. Certainly his posture and height has been effected in late 30's into early 40's. kristian apoears to be at least his listed height! His body looks like the cartoon version of Lurch from 1992 he only needs a brown suit and a flatter stomach. Wow. This guy is Lurch-sized. He doesn't seem to be a pituitary case though, because his face is normal-looking. Rob, if you see him standing next to Big Show, how much do you think Big has him up by?? Editor Rob: Big Show himself can look 6ft 9 at times, but I feel he might look a couple of inches on Kristian, as for the measurement, it would be interesting how much kristian can stretch up these days, similarly Big Show. He looks taller than Bjornsson. 6ft8½ today might be closer. The picture with Rob isn't how he looks today though. He looked 6'8.5" - 6'9" whenever the picture was taken, sure. But now he typically looks more like 6'6". I still wonder if in his 20s to early 30s he couldn't have really been closer to 6'10" than 6'9"? I wouldn't doubt it. But today it's hard to imagine him even stretching for a measurement much beyond 6'7" - 6'8" range. Editor Rob: I think it would help him, in another 5 years he could be struggling to walk. Editor Rob: that his weight and size has really caused him posture problems...he can still manage to walk, just not as well as he could 5 years ago - believe me, he walked far more upright and looked noticeably taller just that short time ago...for last 3 years he didn't want to stand in photoshoots because it's painful for him now. The guy is only 41 now and late 30's in that pic with Rob, which is NOT old, yet he looks much older than his age (late 50's at least) and his weight and posture is making him tilt forward. By the time he reaches 50 or even 60 he'll have lost several inches in height from his peak. as everyone can see in the photo he is 6'9"
His neck has disappeared, all the weight he is carrying is destroying his posture. If he doesn't sort his weight out he'll be 6'6 flat by the end of the decade or in a wheelchair. Maybe he really was 6'10" 20 years ago, and started losing height in like his 30s or something! Would be rare but he looks pretty much 6'9" when he met Rob in the picture here... But now can look only 6'6" walking around! Editor Rob: you couldn't rule it out. I wonder if he would measure himself today, how much of a surprise he'd get. I don't watch Game of Thrones, but this guy is clearly at least 6'9". I bet he'd be pretty close in size and height with The Big Show. Editor Rob: he definitely does look shorter the last couple of years...but still, if you measured him, I'm sure he's going to manage to stretch up taller than he is able to when standing alone. Rob, here's a quote you may want to consider adding "I'm 41 and I'm 6ft 10in. Some people say I'm 6ft 11in, some 6ft 9in. I don't want them to shave off an inch, but I don't want them to add an inch either to disappoint people." Editor Rob: ok mrt, it is a long enough quote to put in the wee box under his photo I think! I believe he was probably right on 6'9" when this photo was taken. The question is: did he used to be just a little higher before this even? Maybe he was 6'9.5" peak, I think he'd be approaching 6'11" if measured in shoes or in the morning if that was the case. Could account for him thinking he was 6'10" - 6'11" range, which is clearly not the case at the moment. Probably around 6'6 now. He was 6'9 in this picture. 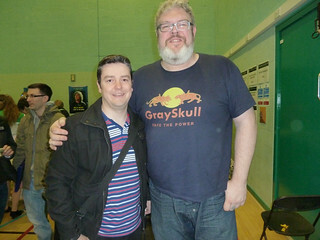 I have no idea how old is Kristian Nairn but he didnt look much older than rob. It's strange that he loss an inch even he had posture issues at age 40s? I know 2 big fellows who were brothers , one was 6'6 350 pounds another 6'5.5 and 345 pounds both in their mid 40s and i have being knowing them over 10 years they still look the same height despite one of them had hip surgery and another had two times knee operation they still manage to keep up their height solid at 197cm and 198cm and only problem was their weight issues keep them hard on breathing. I think Kristian Nairn could have keep up 6'8.5 a chance when get measure.. Maybe..
Hey Rob, you think his claims might've been him busting a gut while being measured? He is a bit on the obese side and might be slouching. Editor Rob: he's standing quite good in this photoshoot, he's certainly not standing worse than me. Rob, am I right if you agree with 5 inches shrinking in 70, then I believe Kristen can be still end up in 6'1-6'2 at 70s, then can be struggle to look even 6 ft and end up in 182 cm or weak 6 ft zone. Rob, am I right? I will be surprised if he lost 7 inches in 80 s.
Editor Rob: He's went from looking taller than big Hafthor, to looking shorter than him...in fact I saw him in July and thought 'this bloke looks shorter than daniel cudmore'! BUT, I think he stands lower than he will measure, natural given his size and the impact on his spine, knees etc. To be fair Nairn hasn't helped himself by giving himself such a big frame. If he was 100lbs lighter he'd be able to move around better. Large people that are both very tall and Heavy do suffer in their joints and such. Evan shaq said he had bad joint pain already when he was in his mid 30's. Editor Rob: I think his knees and back are well and truly f***** nowadays. The Big chap is the same age as me, but he had the walk of an 80 year old man at LFCC earlier this year... I felt sorry for him. I think by age 70 he could end up 5 inches shorter than his peak. Lol, that's the first time I've ever seen you use swear words on Celebheights Rob. Actually I think on a site like this it is better not to have swearing, hence why I put a filter into the comments. I'm aiming for PG-13, not 18-rated. Rob, if you seen Kingma and Nairn in person today, would you think Kingma is 2-3 inches taller than Nairn in person?? Editor Rob: possibly...although in his early 20's he could have always been a fraction taller. In last 4 years he's lost height for certain. Tough thing to gauge with this guy is how much he could stretch up for a measurement. Kevin Nash is still 6'9? Editor Rob: Nash is taller today than Nairn in person, at least an inch. Editor Rob: I watched him at film con and really 6ft 8 could be a stretch today, but...he might still manage to stretch up near it, he simply just doesn't look it walking about. Editor Rob: unfortunately today he isn't quite as tall. He can look more 6ft 6 than 6ft 9. His back is now more curved than 3-4 years ago. Rob, recently Nairn has only been looking 6'6 er with numerous people even with a normal posture, but the size of his head is equal to those of an 8 footer. do you think his weight is really starting to take toll in his back and causing him to appear shorter nowadays?? Editor Rob: yes, he looks to have been carrying a fair amount of weight for years now and that could have taken a toll on his joints being the size he is. @Rob This dude or The Mountain ? Editor Rob: 3-4 years ago I'd have said Hodor in a measuring contest would win the battle for the Height Throne, but today The Mountain does give a bigger impression, Hodor's overall posture last year has made him look 6ft 6-7 range! Rob, what would you reckon the size of his chest?? Editor Rob: yes definitely Kingma shows some more signs and nairn does have a reasonably big head, but some of that in the jowls is of course weight-related. Editor Rob: today I think she would, a few years ago they'd be same range. Why did you put the line on 5'8" then? Do you think he could be measured taller than björnsson today if he would fully streched up? Editor Rob: I think it would be confusing to do it. Today I struggle to see him taller than hafthor, but 3 years ago he could still stand pretty tall, in this photoshoot he managed it with quite a few people. Rob, in 15 years time do you believe he will even measure 6'6''?? In that pic, he looks a hair under 6'10'', but I could see 6'9''. Hi Rob with Kristian Nairn struggling to stand at 6"9, would a downgrade of height be on the cards, as he struggles to posture up in more recent pics, regards. Editor Rob: 3 years ago I think in the 6ft 9 range...lately in last year maybe he's heading to 6ft 8 now. It's quite instructive, the new height lines you've managed to draw in over photos! if you are on a mobile/tablet you can click on the image lines. Rob, is his footwear giving more height than yours. It could be why he's giving such a 6'10" impression here. Editor Rob: 14 inches is a fair amount, by comparison Dinklage is 15 inches smaller than me. I'm standing worse with Nairn than I am with Cudmore. You'd be surprised if you saw nairn and cudmore in person today...you wouldn't think nairn was taller! How tall do you think he might reach straight out of bed? Rob, the only reason why he can pass as 6'10'', is b/c your dropping a few cm from your actual height and Nairn has a fair bit of chunk of hair, otherwise I think he actually looks like a strong 6'9'' in this pic with you. I have a question, did you list him at 6'10'' before on this page? Rob, how many inches do you think there is between Nairn and Whyte? Editor Rob: based on the angle and their positions, I think there is no less than 4, possibly at times more in that clip, but I think you can see at a point Nairn standing a bit taller - his natural standing height can vary. I'm glad I got a photo with him back when he was able to stand tall in photos and didn't begin asking to sit on a chair. It's an old clip, Rob... I wouldn't say Kristian looks under 6'9 there but he's much closer to the camera, so he'll look taller than he is! Kristian doesn't look taller than 6'8 with you and there's a picture with Peter Mayhew, listed at 6'10, who looks a good couple inches taller than him! 6'8 is much closer to his real height, unless he always stands with bad posture with the others! Rob, to end this topic, can you agree that guy is nowhere near 7'1'' (or 6'10") IMO just a tad taller than 6'9'' realistically? I wouldn't be surprised if he loses any height throughout the day he seems bit overweight. Rob, also I don't think that guy too is a legit 6'10''. I just watched one of his videos Click Here Apparently, he was 6'9'' when he was in 8th grade there's possibility he stopped growing or most likely grew another cm later. I think the older he got it gave him the right to exaggerate his height even more to a ridiculous 7'1'' which is BS. This pic is deceiving he actually looks nearer 6'10'', but next to Mayhew he doesn't? lol if you think that 180 - 185 range isnt medium height in Scandinavia youve never been there , or you just have a totally wrong perception . Actually 183 is average there . So 180 would be under the average , so not even medium height . Your not considered tall in any european white country . Rob, do you think that chick who was in WWE, who claimed 6'9" and 245 lbs would edge Nairn today? World average height for a male is 5'7-5'8. Ever been to Asia? South America? Latin America? Many countries where men are below 5'7 on average.. And theres no country where 180-189 range is considered 'medium'. Its fairly tall even in Scandinavia and in Holland. Rob, you think a peak and current height could be in order for this guy? I know he's young for that, but maybe a 6'9.5" peak and 6'8.5" current might tell a more realistic story for both what he used to be and what in the best case scenario he may be able to stretch himself up to today. Average height is 175.9 cm for males aged 20 and over. That chart made me lol big time bro. On a global scale, 180-189 is high. I think it's pretty likely he's prematurely dropped height, he really doesn't look much more than 6'7" today but maybe he could still measure a strong 6'8" if standing his best. I think he was likely in the 6'9" - 6'10" range until recently. Some people have really weird opinions on what's short, tall, and average. That "G" guy is one of them. And I think 6'9" seems accurate for Nairn. No less. How is 170-179 cm low? That's average in most countries. And 180-189 cm is considered tall. What would you say he's looking here Rob. Rob, is he taller than Bjornsson? Hello. I heard that to be considered a giant, should be a foot taller than average. In my opinion related to the heights: 149 cm or less: gnome. 150-159 centímetros: extremely low. 160-169 centímetros: very low. 170-179 centímetros: low. 180-189 centímetros: Medium. 190-199 centímetros: high. 200-209 centímetros: very high. 210-219 centímetros: extremely high. 220 cm or more: alien. I don't know how one can decipher 0.25 diff anyway when they're as big as this anyway! Rob, how about 6'8.75 seems at Bjornosson is at 6'7.75! Then, he doesn't even look 6'8 with you... You think he might have lost some height in posture? I could buy 6'8 but 6'9 really seems a stretch! First of all, you said he's got more a 11 inches head... You also said you were standing more 5'7 here... In any case, look at Ali's picture! Is that a 6'5 guy vs 6'9? I see maybe 2 good inches, certainly not 4! Rob, you said when you took this picture he still looked 6'9 range, right? But let's be objective, would you say this how a 5'7 guy would look next to a 6'9? He looks maybe between 6'7 and 6'8... And how the hell do you think he got 6'11 on a measuring tape, it seems absurd! Maybe 6'8.5" today and 6'9" peak. He could suffer with knee/back problems these days which won't make him able to stand tall. I have an injury in my left knee at the moment and if I exercise with high intensity it gets so tense that I cannot straighten it fully. I measured 1.5 cm shorter the other day because of that, though I measure my normal height again now. Of course I forgot about Nairn's longer massive head until just now... He is a huge fellow. I wonder why he's claiming 6'10/6'11 though... I mean it's odd, it would seem he has no reason to lie, yet he's clearly not that height. I can believe 6'9, no more. (Though a guy his size could certainly lose height faster than a typical man, not to mention he probably varies at least 3cm from morning to night. I liked the expression "G'ing"
Lol,That would be the ultimate tribute to G's long career as a 5'8,what do you think? Who knows if the site becomes very famous,this could happen. Lol. I am just now seeing that. As far as Nairn is concerned, he was always 6ft8.5, and maybe a fractional loss combined with poor posture makes him look even less today. peak 6'9 (206), what would be your time now? [Editor Rob: last year at collectormania in glasgow he struggled big time to look anywhere near 6ft 9. It's hard to tell how much height he has lost or exactly what he might measure because he seems to carry himself shorter. Rob he looks much shorter today. Do you agree he looks struggles to look over 200cm today? Still a big dude, but needs to lose 100 pounds or his spine will only further degenerate under that immense load. Sickening loss. There's no way that this guy is only 6ft6-7! I've got people in my family that range and up close they do not look anything like that next to a 5ft8. Rob,how can he look only 6'6-7 when you said he looked near 6'9 only 2 years ago? and he's only 39,maybe he could measure 6'8 assuming he could already have lost a fraction due to weight,but 2-3"? [Editor Rob: he wasn't much taller than Clive Russell the day I seen them last year in glasgow...whether it is a compressed spine or he's now got disc damage and lost height is harder to say. Click Here taller than kevin nash also listed at "6'9"
Do you agree he doesn't look over 6'6 there? Rob, how tall you think this guy looks with Nairn? Rob, on Wik it says he is 6'10 3/4". Do you think that's possible out of bed height? When this photo was taken, what would you estimate his size(weight) at? I think he looks around 425lbs. Yeah, I imagine his weight would catch up with him at his height easily, I wouldm't blame him for sitting. Looks about 6ft 9 could be 6ft 10 out of bed. Is funny, I thought of, André when looking at the above picture. Shades of Andre sadly - very heavily built with his joints bound to suffer. 6'9-6'10. How some see 6'8 is beyond me, but whatever maybe it makes you feel better. He has 13-14 inches on Rob easily. Perhaps he's having some health issues and that's the reason for the chair. That would make sense with the way you described his issues with walking. Can't believe this man is only 38 years old (all the white hair). Easily 440-470 pounds imo. [Editor Rob: he seems nice enough with fans, although I have to question why he is sitting down for some photos. Unfortunately he sat down :( huge fella though. Rob, if you put Nash and Nairn under the stadiometer who do you think would come out taller? Actually his posture last few shows is up and down, he goes from looking more 6ft 6 up to 6ft 9. Nash and Tyler Mane can give a bigger impression as they have better posture and can hold the 6ft 8 range easier than this guy. As a side note, even with only 25 people at last event wanting a photo (about 5 minutes really) he still asked to sit on a stool for the shots. Why would a person who's already over two meters tall lie about their height, and paint themselves as even taller? Especially by two whole inches? He looks taller than Kevin Nash. What type of footwear was he in? Kristian is an awesome looking big lad. I recon he looks 6'9" but i wouldn't put 6'10" out of the question too if he stood as straight as possible. Either way, a great giant from a great show ! @lorne. To be fair a lot of people aren't going to argue with him at claiming that! Guys this big can get away more with exaggerating their height! 6ft11ish!?! Ha! A 6'9 range guy is G'ing it up!!! LOL at 20 million over 7' maybe 10,000 tops. 1 out of 200,000 adult men seem reasonable.Outside BB fields you will almost never see someone that tall.20 million at 6'3 and 200,000 at 6'6 is possible.Wonder where this guy got his source. I just stood next to Kristian tonight. His head is massive. I am nearly 6'2" and he easily had 9 inches on me. He is a really jovial and nice guy. Stood and took pictures and selfies with fans far longer than any of the other cast outside NYC hotel in the cold. Laughing and enjoying the folks the whole time. Kristian look 6'8 easily with rob. I see 1 feet difference the two. For me your photographs of ageing celebs are the most valuable on here in that they give an indication of much height they've lost like David Prowse and John Rhys Davies. Of course a photo with Cruise or Stallone would be the holy grail of celeb height photographs but you're unlikely going to meet them and have a photo, it could set you back a mint!! It seems that way, which makes it difficult to judge height!!! In all honesty a lot of your photos Rob cause half the arguments here because they see a celeb in a photo with you at a dead cert 5'8.25 with a certain posture or camera angle as it was taken and assume that it is exactly how it looks in person. Of course it's great to have the photos taken with celebs but you see what I mean about how some photos can convince some of the posters here that you're too generous or whatever. Rob, if they were side by side that shouldn't make a difference. Of course if you move one or the other forward or back, even slightly, it can make a pretty big difference. Camera perspective is a tricky thing. OK yeah, slight misjudgement, lip level for a 5'8" range vs 6'4 range. At 6'6" Rob would be maybe a fraction under your chin Ali? Not in the pics I've seen like George Romero, Ryan McPartlin etc Ali Baba. I also think if Nairn stood next to a stadio 6'5" would come lower than where you think. You don't honestly think he's only an inch taller than you Ali? 5'10 guys are around my upper lib level and I'm 6'5. If they're legit 6'4 he doesn't. More around the lower lip of a legit 6'4" guy. 6'8 range is totally possible even rob didn't rule out that. I personally think he's 6'8.75 or so but rob already dropped him from 6'10 so he may anger him if he drops more off! Rob what would you guess for his out of bed height? I could actually buy 210-11cm, as I say a guy like him could lose as much as 2 inches I think. I think the position of the photograph hiding the legs and his head is fooling a lot of people here. I'm sure in person he actually looks easily 6 ft 9. His head length and shoulders are surely markedly longer than average. If you consider that Rob generally comes to the bottom of the nose of legit 6'4" range guys look at the height gap between the end of the nose and where Rob's head comes on him. 6'7"-6'8" is ridiculous. @5ft10 guy, Nah, he's at least 6'8.5". Probably 6'9" right out of bed. I'd dispute that, I think he could actually be 6'10" range out of bed. A guy as big as him could possibly lose as much as 2 inches in a given day. Sam not only Nairn, McCann and Whyte. You have Waldau and Dance over 6'1'' also Sophie Turner is a pretty tall girl and what about Gwendoline Christie at 6'3''? Clive Russell is 6'6'' same as Nonso Anozie and Ian Glen is also at least 6'0''. In general it is indeed a tall cast. He has at least a foot on Rob, def not under 6'8 and probably around the listing. Yeah, beyond Peter Dinklage, lots of the other main cast of Game of Thrones is not that tall, i.e. Kit Harington, Sean Bean, Alfie Allen, Richard Madden, Emma Clarke, etc. Certainly, guys like Nairn, McCann and Whyte raise the average though. Tallest cast in history...Guinness Book of Records need to be notified. This is how I look with my grandma whose 5'4 - 5'5 and I'm 6'5 so yeah this listing is correct. What do you think Rob? I don't know where you got your figures from guys but if you seriously think there's as many as 20 million men over 7ft in the world you live in cloud cuckoo land. There's probably only about 50,000 men over 6 ft 7 in the world let alone 20 million over 7 ft!! I'd say it more likely to be nearer 2000 men in the world over 7 ft actually. Mike, according to your statistic source, over 20 million men in the World are 7 foot tall... Probably the most delusional thing Ive read on this site so far, and that says quite a lot. 6 foot 1. its 70% more tall that almost people. 6'5 84% 6'7 87% 6'10 96% 7 foot 99% 7'6 100%. Globally, 6'1 is on the 98-99 % percentile. 6'2" is taller than 96% of the population in the US. Seriously Emil? He looks a good 4 inches taller to me. #15 has a camera angle advantage and therefore he looks taller han 6'5 next to Rob. Nairn, however, has a large head and the camera is probably straight. And Rob's estimation is the one I trust the most, just like you. Ok, 6ft9 is believable, only because of his head size. Looking again, he's taller than Cudmore, but not by much. Nairn looks nearer 6'8 a lot. He does seem to have short arms for his height, but that's only when you look and compare them to Rob's. I doubt their wingspan is such a massive difference like there is the height difference. At least the size of his head makes up for it. Well arch stanton 6-7 is very tall and 6-8 is almost a giant in the usa . 6-9 -10 is the start of giant range in the USA. 6-6 is very tall but not a giant . 6-6 guys will look short next to real giant guys like 6-10 or 6-11. I was posting that because some people are saying in this site 6-6 is a giant . @ Lillo. I saw an interview with Greg Davies the other day and he said "6 ft 7 and above is officially classed as a giant and I'm 6 ft 8". This guy is more than just very tall, he's a giant clearly, look at the size of his head!! He's just not 7 ft + freakiness. 6'6 isn't a giant . Lol 6'6 is very tall . I would say any guy over 6'10 would be considered a giant, just the same as anyone under 4'10 is considered a small person. An average height of 5'10 is bang in the middle of that, so a whole foot taller/shorter makes the most sense to me, at least that's my take on it. This guy is borderline giant, however what difference does an inch make when you're that big? In person I am sure he could easily pass as such. The guy looks fricken' huge. Ice not true!!! My arms aren't the same as my height. Them explain how 6'5 basketball players can have 6'10-7'0 arm span. Wingspan has a deviation if at least 6 inches. I agree Nairn's arms seem to be 6'1 guy's.I explained why I think this could be. Of corse arm leangth is porportional to height !! No, it isnt. Arm pit to fist is not proportional to your height. Do you ever watch boxing? It is very common that a 5'6 boxer has the same arm length as a 5'9-5'10 guy and verse visa. Look at Floyd Mayweather. His arms are the same length as Wladimir Klitschko's even though Floyd is 5'7 and Wlad is 6'5-6'6. Finger length is more proportional to height, arm length isnt. More a weak 6'9 than a solid one. I'd say someone like Kevin Nash would edge this guy out. Yeah I still think he'd go about 1/4 over my 6'8.25 doorframes I think he can seep below 6'8.5 on a bad day. I would have dropped him to 6'8.5...maybe Rob will if he sees him again Rob seems open to 6'8.25-6'9 its so hard to pin such an enormous giant of a guy down to the very .25 of an inch, but we're making progress! what the hell ? his arms are the same length as robs !!! @JimB, I had a classmate who was 6'6". He was the tallest person in our school, but I wouldn't consider him a giant. Tall? Yes. Giant? No. There is another website that specifically lists giant's as 7 feet or over. In fact, Andre the Giant is on their list--just qualifying at 7 feet. Although, I think Andre would qualify as a giant even if he was 6'11" because of his sheer girth. The listing is now accurate . This guy looks like a legit 6-9 . When he says 6-10 , he is claiming his height in shoes . Ok he doesn't have LONG arms for his height but can you guys really not see that his left arm is bent? His arm would be significantly longer than Rob's rather than slightly if he simply straightened his elbow. Just over a foot difference in my opinion. 6'9 seems spot on! Has a 'gentle giant' look in person. I think my wing span is 5'10 and I'm 6'0. I think when it happens means you're not supposed to be that tall and outgrew your potential. Like this guys arms stopped first (like most people) and he was probably supposed to be 6'5 or less and he grew almost 4 more inches due to some fluke or hormones/additives in the food. He may not be genetically tall. Wonder how tall his relatives are. An adult over 6'6" is a giant so does it really matter whether he's 6'8" or 6'10"? I thought it was only us shorter and average height people who are to be singled out to be made to feel insecure about our height? How does he look as tall as 6'9, to you? 6'9" is a good listing. He looked 6'8.5" with Big John, but I think giving him the 6'9" is ok. I knew a guy who was like 6'2 with size 7 feet. So I guess you will get the odd really tall guy with short arms for his height. What you don't see is the size of his head. His head is so much larger than a normal one, that a lot of height is in his head, giving the impression of being shorter, just like with Andre the Giant. Well done Rob I can buy 6'9" although 6'8" range is a possibility aswell. Ok i saw the pic nairn with big john yeah i suppose nairn is 6ft 8.5. Yeah, people dont realize that what they got here is essentially a 5'7 guy next to a guy who's supposed to be 38 cms taller! Just noway! He looks 6'8 at most! Nairn comes off as a nice guy in interviews...loves to DJ on the side. I don't think Rob has to worry about getting into a fight with this 6'9" range, 350 lb+ guy. huge head . ROB ,arent his arms kind of short for such a enourmus man ? hey Rob over two years ago i was measured at 180cm i was barely 19yrs old then, what do u think could possibily be my height.meanwhile i think i have added a little because my head now touches my doorframe which previously was not so. thanks. waiting fro ur response. @Phantom my stepdad is 6ft 5 1/2 6ft 5 or over is very tall but i dont think its quite considered as a giant yet, 6ft 7-8 is when giant terriotry starts i believe. For Narin i think 6ft 9.5 is what he looks. Phantom a legit 6-6 or 6-7 guy is huge but I would describe this height as very tall height . When a guy is about a foot taller than average is definitive a giant . I strongly believe he is 6,8.5 at best. Not even a legit 6,9 here. Rob, are you gonna downgrade him? Anyone over 6'5' would probably be considered a giant by most people outside of the NBA in the US. Figuring that this big John guy is 6'1", which looks right given some of the other pictures he has compared to celebs, I'm seeing maybe about 6'8.5" in the photo with Kristian. I just don't see 9" there. Call me crazy, but Kristian looks closer to his claim with Rob than he does with Big John, the top of Big John's head reaches Kristian's tip of the nose,and that's usually 6 inches! Now, I know that estimate is of no use here because Kristian's head is bigger than normal so his face features are larger, IMO he is 6'8.75". I think 6'8-6'9 is closer. Would you say he has 7 inches in Big John or 8? 7.5 looks tops right? Rob, if your friend is max 5'8 and he's able to reach Nairn's chin, how can Nairn even be 6'8? I mean, could this guy's head be a foot long? I dont think so. Maybe, he's just having bad posture with your friend? I don't buy this guy at 6-10 with Rob but he could be a legit 6-9 . By the way a legit 6-9 is in the giant range . 6-9 6-10 is the start of giant in the USA. I think up in this range, it's hard to estimate. This guy coul really pass for around 6'9" but not over. Probably needs a slight downgrade.